A message to soil science colleagues from PNNL computational biogeochemist Kathe Todd-Brown: Your data set is gold. Unlock that data's potential for reuse, she writes in a Nov. 30 blog post, by making them available, discoverable, and harmonized with similar data. Don't let data go undiscovered in a notebook or a computer. Don't even let a published paper be a data set's last resting place. "Digging for data gold in soil," Todd-Brown's advice on data archiving, discovery, and harmonization, appears in Beneath Our Feet, an international forum sponsored by the Global Soil Biodiversity Initiative. It's her second blog post on the site; the first drew more than 5,500 Twitter impressions. 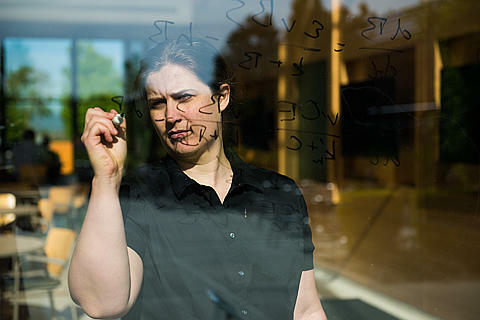 A mathematician by training, and now a Linus Pauling postdoctoral fellow in the Microbiology Group, Todd-Brown designs computer models of soil carbon cycling - or "how dirt breathes," she explained in a #WomenInSTEM YouTube feature.